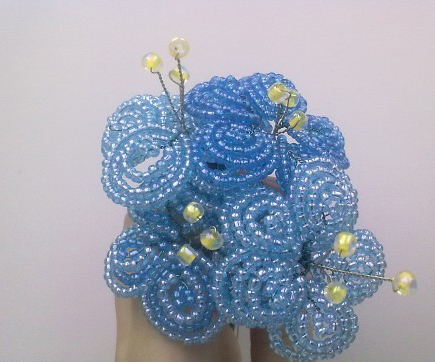 Make a beaded bouquet of flowers out of small beads by stringing them onto thin wire thread.The symbolism of blue beaded flower bouquet makes me think of that the clarity found in our dreams, thoughts, and imaginations. The colors speaks to the dreamers in our world, and beaded flowers bouquet are the perfect gift to call out the muse in the poet, artist or musician in your life. Create a bunch of beaded flowers when you need a boost of inspiration. They are also the perfect hue for enhancing calm and tranquility. Beaded flowers have a calming effect. They cool the emotions and create a contemplative mood. The peace derived from beaded flowers bouquet also makes them an appropriate sympathy or get well flower. A bouquet of beaded flowers will last forever! The Beaded Flower Bouquet is a central symbol of Inspiration. It stands for desire, love, and the metaphysical striving for the infinite and unreachable. So why not to use this beautiful flower in our craft work? If you are after a truly one beaded bouquet, you can create it for yourself. Every bouquet can be lovingly crafted by you with beads and colors of your desire!